rencontre femme asiatique vivant en france gratuit sites de rencontre pour catholiques cherche femme senegalaise http://www.cccbc.net/mardyl/3041 you could try these out rencontre femme de l'est mariage conocer gente gratis sin pagar free dating sites for disabled in usa without payin with cerditcard citas de mujeres y hombres y viceversa Website Meet the Franchisor 2017 presented by The Kensington Company is a great way for anyone who is considering business ownership to learn about ten Franchise Companies who are looking to expand in our area. The Franchisors presenting join us from all over the country and have targeted the Long Island market for expansion. Each of these Franchisors are pre-screened and come from different industries, each offering very different business models. There is something for every budget and the brands presented range from low cost & scalable service businesses to multi-unit, empire building opportunities. Attendees will have the opportunity to hear 10 presentations in under two hours. Shark Tank Style. Attendees can sit back, relax and listen to 8 franchisors talk about their business model as they are looking to attract qualified candidates in our market. In addition to the franchise companies presentations, there will be a valuable information on financing your franchise as well as a presentation from The Kensington Company on learning the top 10 tips on Franchising. Each Presenter will be presenting for 10-12 minutes. Following the final presentation, guests will be led into a large networking room for a complimentary Lunch or Dinner with the ability to network and talk with the Franchisors, Franchise Lenders, as well as team members from The Kensington Company. In addition, there will be valuable resources in the room for the attendees to take advantage of including connecting with Accountants, Attorneys, SCORE, SBDC, Lenders and more. 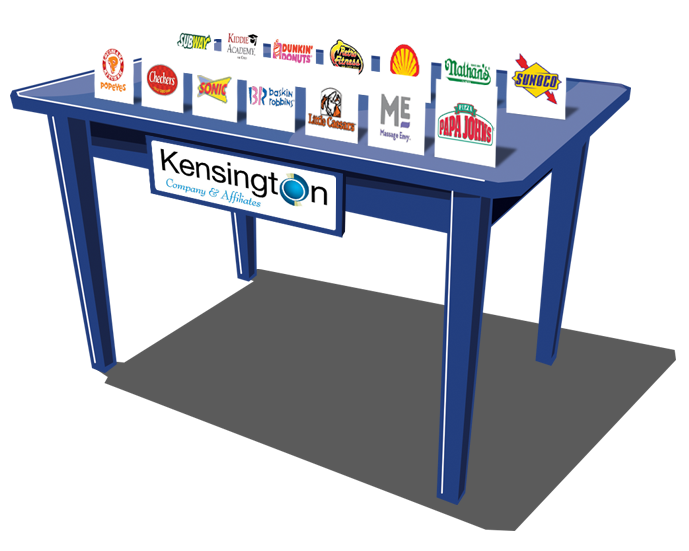 Be sure to stop by The Kensington Company Business Franchise and Business Resale Table to learn about business for sale throughout the Tri-State area. The Kensington Company is a full-service business brokerage firm representing a wide range of business opportunities of both independent businesses as well as Franchise Resales. Kensington Company has an extensive Franchise Services Division and is a leading Franchise Resale Broker with an exclusive inventory of Franchise Resales ranging from Dunkin Donuts to Massage Envy. Information on all our Franchise Resales will be available at the event, so be sure to visit our Business Franchise and Business Resale Table. Complete your Personal Franchise Assessment and be matched to opportunities that fit your unique search criteria. The Kensington Company offers free one-on-one consultations to help educate would be Franchise owners on how to properly investigate Franchise opportunities. As an affiliate of FranNet, the leading Franchise consulting company, we use a comprehensive business assessment tool to better understand your business goals and comfort levels. We work together to use this information to identify Franchise Development and Business Resale Opportunities that match your unique business search. The Kensington Company is able to point you in the right direction with your financing needs. We work with lenders who can help with SBA Loans, 401K Rollovers, Quick Start Programs, Lines of Credit, and other financing options.